Parlez-vous pom pom? 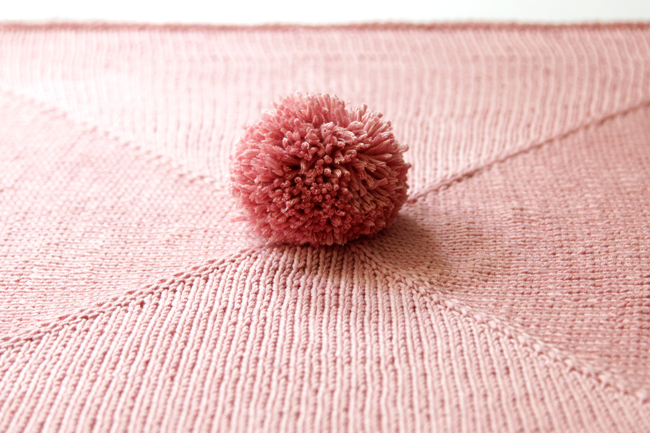 When it comes to this mini blanket, “le pom” says it all – the pom! 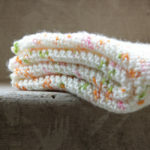 This wee blanket is so adorable, quick and easy to make. 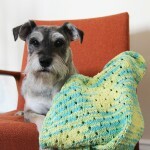 You’ll find yourself cranking out a bunch of these for baby shower gifts galore! 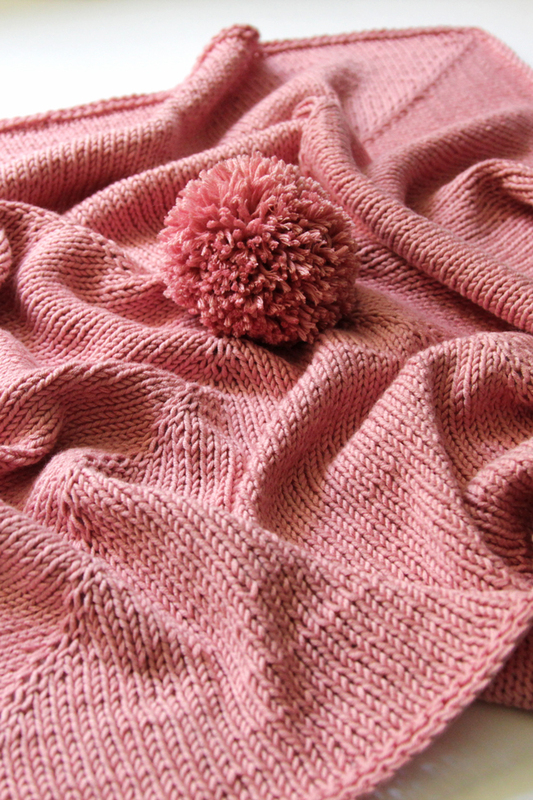 The center-out construction comes together quickly, and is not unlike shawl knitting, which is totally addictive. 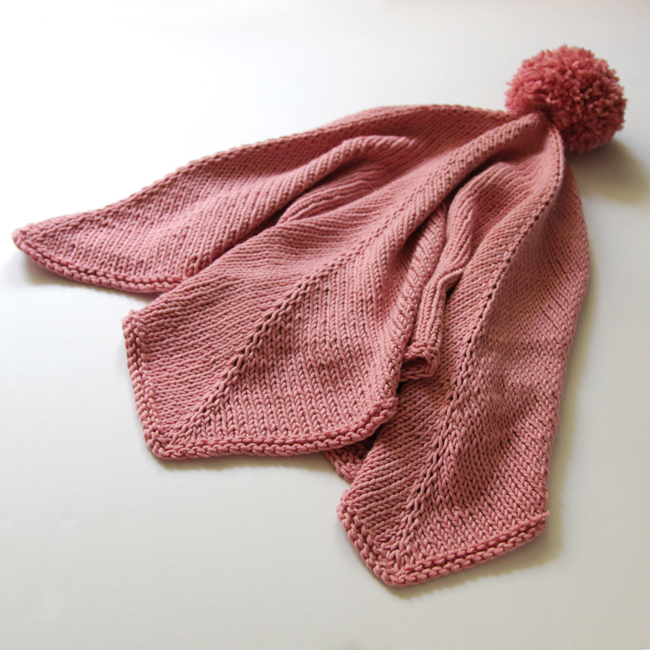 This is one of those patterns you can toss in your bag to work on at the beach or out at the movies, plus it only takes 2 skeins of cotton yarn so it won’t break your baby gift budget either. Nice when that works out so well, doesn’t it? 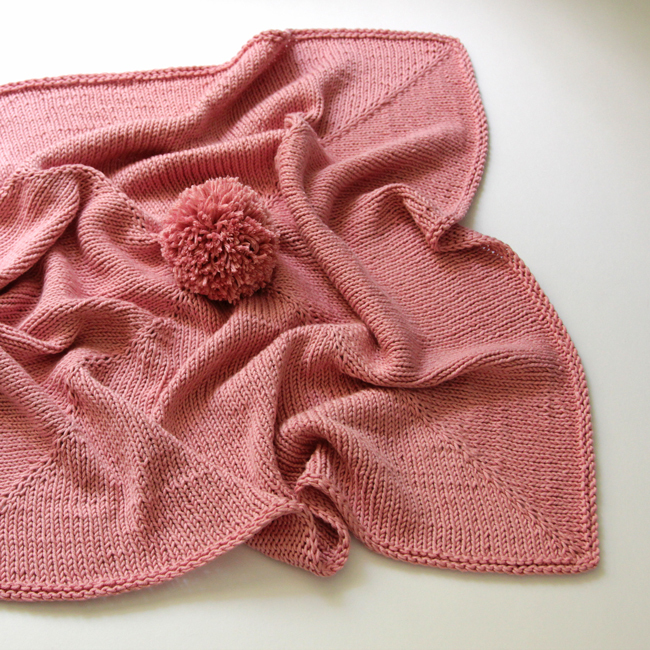 Gauge & dimensions: 21 sts & 25 rows = 4″ (10 cm) on US 6 needles, finished blanket measures 22.5″ x 22.5″ after wet blocking. CO 8 sts & join into rnd. rnd 1. (pm, k2), rep from ( to ) arnd. rnd 2. (sm, M1, k to 1 st before m, M1, k1), rep from ( to ) arnd. rnd 3. k arnd, sm as you go. Rep rnds 2-3 until there are 352 sts total (four sets of 88 sts). rnd 4. p arnd, sm as you go. rnd 6. BO as follows: rm, p2, ppso, (p1, ppso), rep from ( to ). rm as you go. Weave in ends and wet block, pinning blanket at ~22.5″ square for best results. 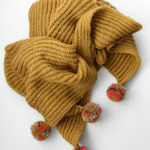 Bonus tip: If you have a teddy bear head laying around, or want to knit or crochet one up in the yarn set aside for the pom pom, totally do it! Instead of attaching the pom pom to the center at the end, just attach your little toy head. Then you’ve got yourself a blanky like the one from The Brave Little Toaster – remember how cute he was? Yarn provided by Lion Brand Yarn. I don’t understand how you join in the round. its only 8 stitches! please help. Just like you would with a larger number of stitches, but the Magic Loop method will be needed to start due to the small stitch count. If you prefer DPNs, you can use those before swapping to circulars for knitting the bulk of the blanket. 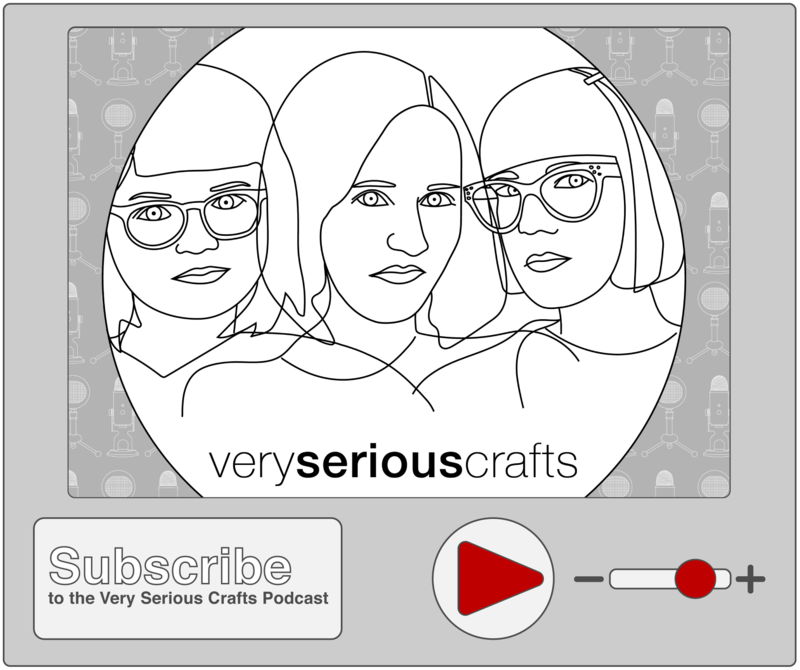 If you’re new to Magic Loop projects, here’s a tutorial I like: https://www.craftsy.com/blog/2014/10/demystifying-the-magic-loop/. Let me know if you need any help! Sorry I didn’t see this. Thank you! Went to LYS and got help getting started. Now I know how to do magic loop! Always trying to learn something new. I do have another question. I’ve finished, yay! But even with the finished edge it’s really rolling up. Will the blocking fix that? I ordered blocking mats and received them yesterday. Wanted to make sure it will flatten or should I crochet another edging? Sorry I missed this. Thanks but I went to LYS and got help getting started. I know how to do magic loop now! Yay. Hey my edges are curling up even with the edging. Will blocking fix that? Yep! 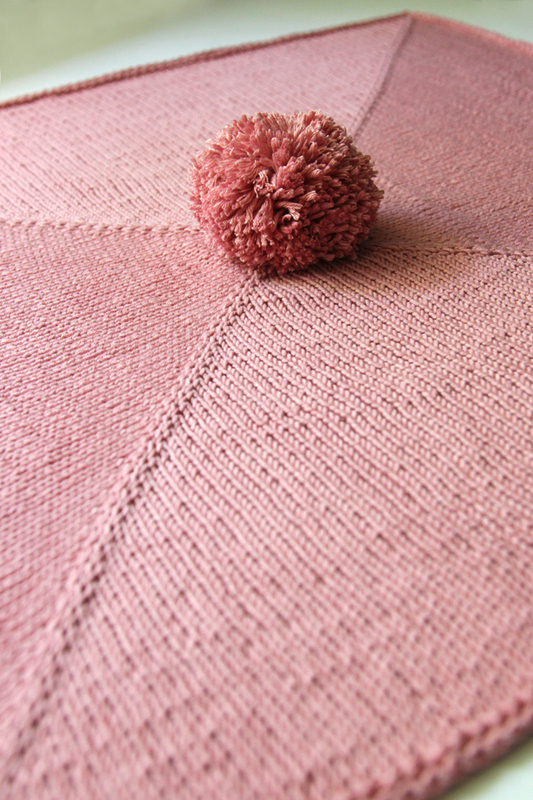 Make sure to wet block it and use pins to get a perfectly square shape on your finished blanket. :) Good luck! Which M1 method did you use? Never mind. That was a dumb question. It has been a long day. Ha!